The sun is beating down on us. It is very hot in Mombasa and this is just the beginning of the hot season. Dinners these days tend to be either fruits, salads or something very light. Having a heavy dressing on a salad in this hot weather is not very appealing so I stick to my famous vinaigrette dressing made at home. Red crunchy and juicy apple, slightly tart is a perfect compliment to the refreshing cucumber and to add a bit of the sharp taste I added an onion. Quick,easy and filling. 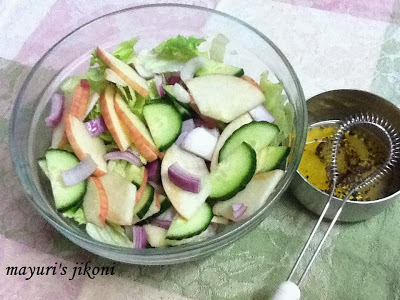 I once made this salad to go with pizzas and my guests loved it. Go on, get that apple and cucumber out to make a healthy salad. Mix the salad ingredients in a bowl. Whisk the dressing and pour it over the salad. Prepare the salad ahead and keep it in the fridge to cool. However do not add the dressing and onions. Sprinkle some lemon juice over the apple slices so that they do not turn brown. If the skin of the cucumber is crunchy, do not peel it off. Add fresh mint, basil if you like. I just didn’t get any in the market.